Gum Fighters offers the most cutting-edge techniques in the industry for attacking the problem of chewing gum waste on sidewalks at commercial and retail properties. We are one of the few companies using a low pressure, high temperature steam cleaning method originally developed in Europe. 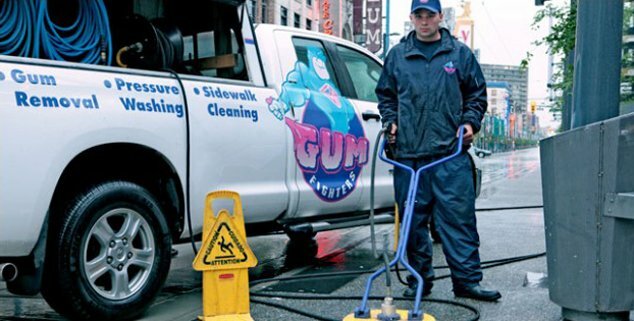 When our steam machines are used in combination with our more tradition hot and cold water pressure washing methods, Gum Fighters can offer the most comprehensive methods available to keep your property's sidewalks free from chewing gum litter. Our unique process for steam gum removal is actually quite simple and it is all done in 3 easy steps. First the solid gum is treated with 130°C dry steam. As the steam works to soften the gum and release its hold on the concrete, gentle agitation works to liquefy the gum. Finally, the excess waste and dirt is sucked up with the machine's vacuum attachment.